Dar Afram - hoteldaraframs Webseite! Riads are ancient, private residences that once belonged to sultan princes, aristocrats and noble families. 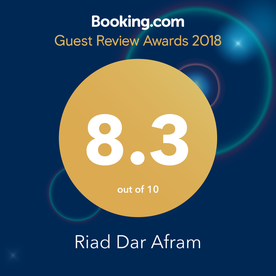 Riad Dar Afram is a traditional Riad located in the heart of the ancient Medina in the beautiful coastal town of Essaouira in Morocco. The Riad has been totally renovated and decorated but maintains the traditional style of a Moroccan Riad. Music is at the heart of the experience in Dar Afram and we frequently have impromptu performances by local artists. Alongside the main lounge room is the dining room. Breakfast and dinner are provided to all guests, although the evening meal is entirely optional. The food served is always a selection of the finest Moroccan delicacies. We have six rooms with ensuite bathrooms which each can accommodate 2 to 4 people. On one of our two sunny terraces there is a traditional Moroccan barbecue where you can indulge in rooftop meals as you watch the sunset or gaze into the moon light. 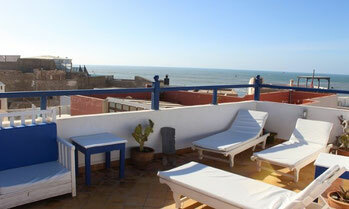 The beautiful roofs with a 360° view of the sea and the wonderful city will let you love Essaouira!!! 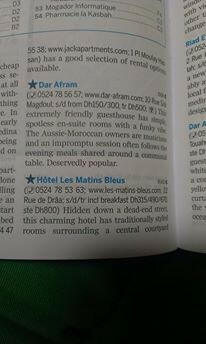 (0524 78 56 57; www.darafram.com; 10 Rue Sidi Magdoul; s/d from DH 150/300, tr DH 500; WIFI) This extremly friendly guesthouse has simple, spotless en-suite rooms with a funky vibe. The Aussie-Moroccan owners are musicians and an impromptu session often follows the evening meals shared around a communal table. Abdellatif and Tarik, the Moroccan-Australian owners, have kept the classic Moroccan style of this laid-back riad, with stained-glass windows, painted wooden ceilings and colourful kilim rugs. The six rooms have en suite bathrooms and are spacious enough to hold extra beds for families or groups of friends, while the patio garden has been converted into a convivial lounge area. Essaouira is one of Morocco’s most musical towns, from exuberant Gnaoua rhythms to a gypsy and flamenco festival in October. Musicians gravitate to this riad, and it’s not unusual for impromptu all-night jam sessions to break out in the candlelit Moorish salon or on the roof terrace post-barbecue. You must come and visit us!! !